There were kids posing with police horses, young fraternity brothers and sorority sisters stepping lively to the music and a woman with gray hair and smooth moves showing off her roller skating skills. 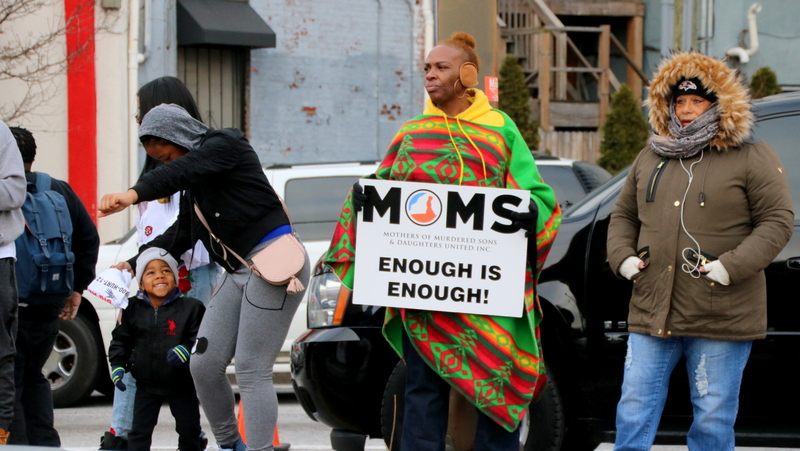 But there were also representatives from Baltimore Ceasefire and from MOMS (Mothers of Murdered Sons) – reminders of a year when Baltimore suffered through a record number of homicides, among other troubles. The blend of somber and soulful at Baltimore’s 18th Annual Dr. Martin Luther King Jr. Parade today was fitting, not only because it capped a tough 12 months for the city but because the event almost didn’t happen this year. “It’s great to come out and see the marching bands and everything. 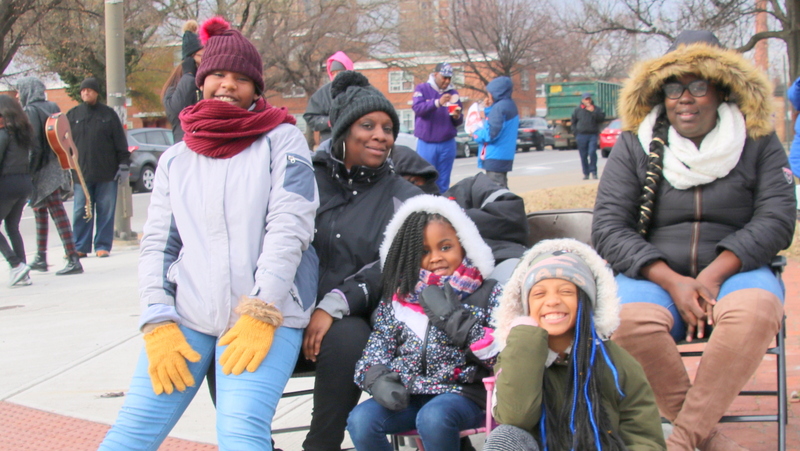 I’m so glad Mayor Pugh didn’t cancel it,” said Tynette Galltin, who was standing on the parade route with her 7-year-old daughter Maya. 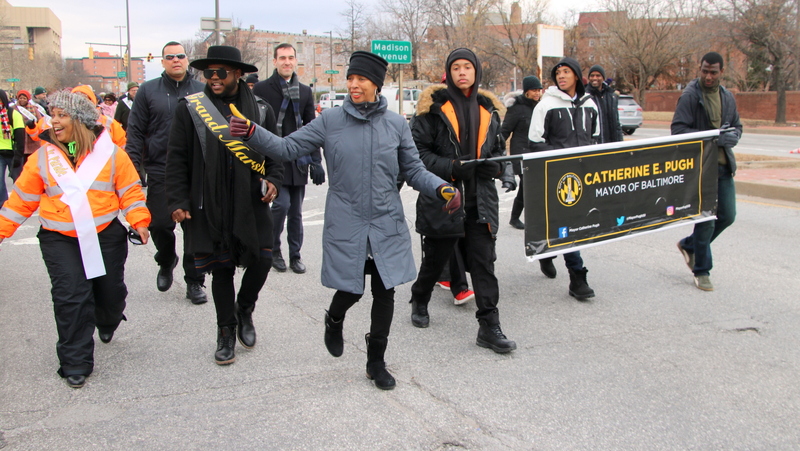 Galltin was referring to Mayor Catherine Pugh’s proposal to replace the parade with a day of service and a battle of the bands, an idea she dropped after public outcry. “I was upset when I heard it. We’ve been coming to the parade every year for a long time,” said Galltin, 43. This group at the McCulloh Street intersection of MLK Blvd. was bundled up against the cold. 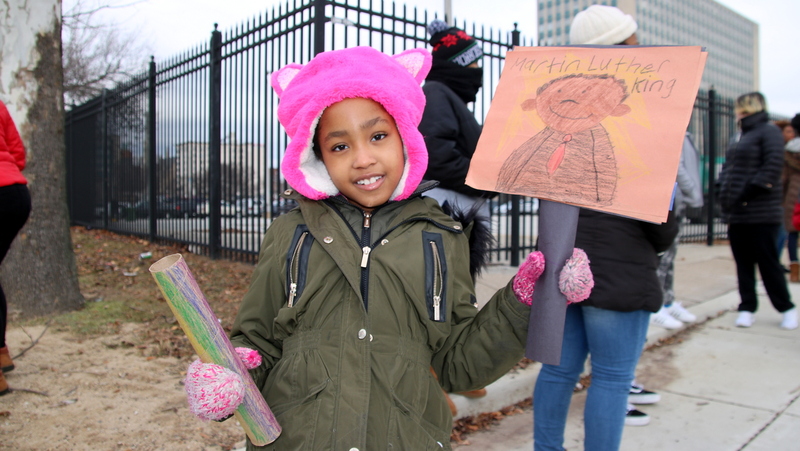 Maya, clutching a drawing of Dr. King, was asked what she knew about him. “Well, that he died,” she said. Amid parade perennials – like the Dunbar High School Marching Band and Drumline – current causes were on display as well. One issue was raised in the form of a comment directed specifically at Pugh as she and Parade Grand Marshal (and finalist on “The Voice”) Davon Fleming swept by. “Hey, mayor, how about that $15 minimum wage?” a man said, referencing the minimum wage measure Pugh vetoed last year after promising on the campaign trail that if elected she’d sign it. 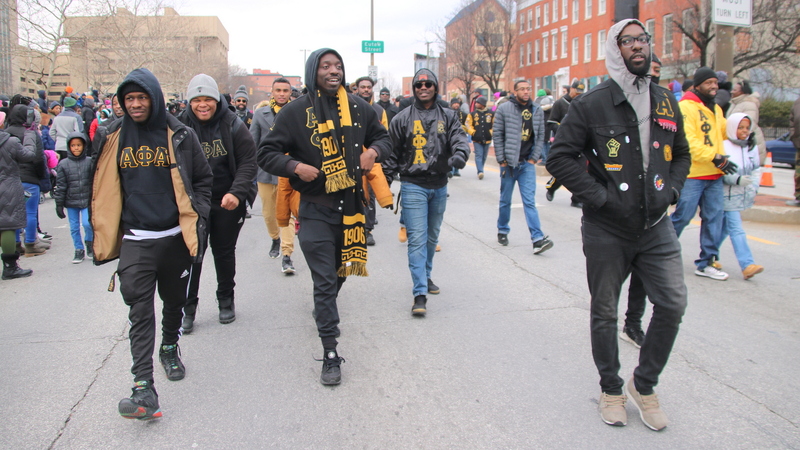 The brothers from Alpha Phi Alpha were out in force. 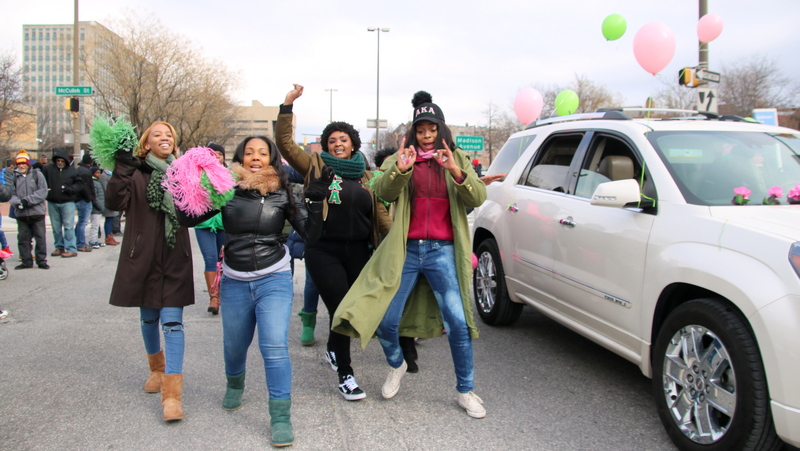 The exuberant women of Alpha Kappa Alpha. 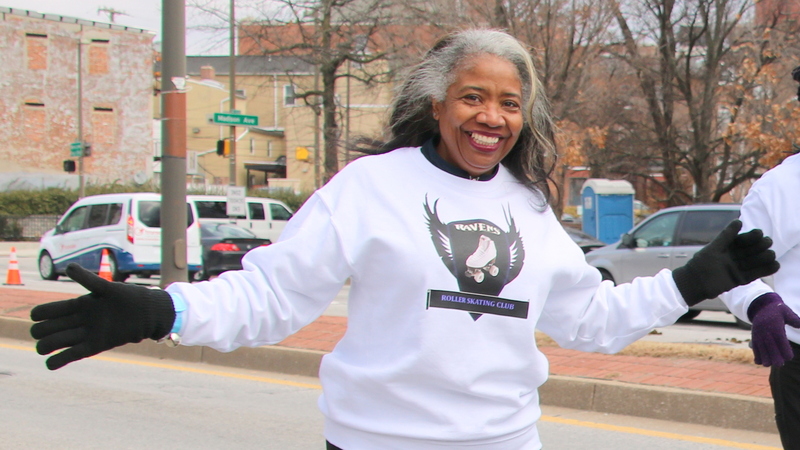 With fellow skaters, rolling down Martin Luther King Jr. Boulevard. 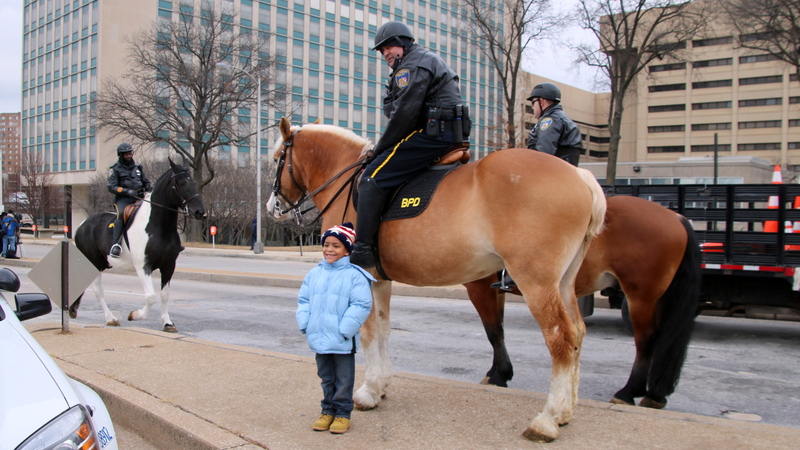 “You got the best picture today!” adults told this boy, as he posed in front of one of Baltimore’s mounted police. 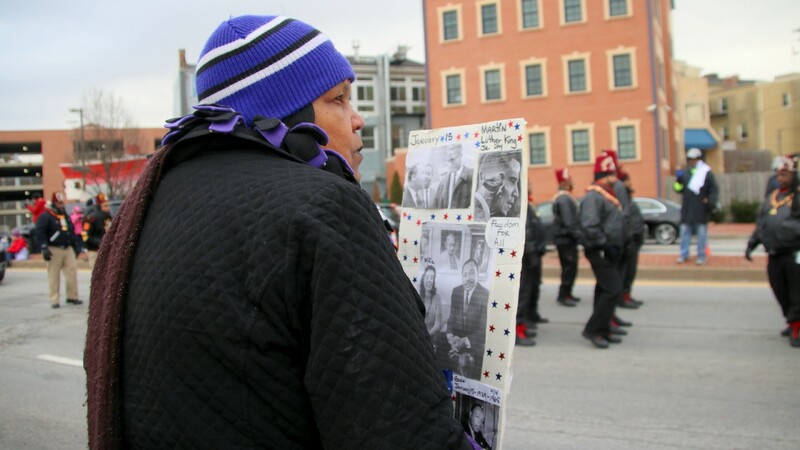 Amid the cheering and brass bands playing, the group from Mothers of Murdered Sons stood quietly.